Last weekend, I ventured with my family to the “other side of the metroplex” to visit the Kimbell Art Museum in Fort Worth. And after an afternoon filled with impressionism, people-watching, and gawking at useless museum store merchandise, we stumbled across greatness at Sweet Sammie’s. The concept is simple. 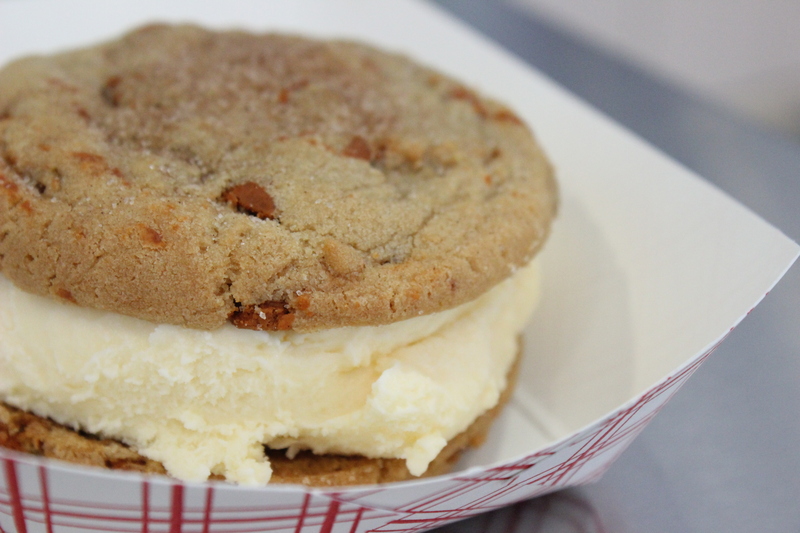 Two cookies of your choice and one Blue Bell ice cream flavor. Smush it all together, grab a few thousand napkins, and dig in. Ohhhhh yeahhhhhhh. The perfect (if not a tad on the unhealthy side) snack for a hot Texas afternoon. 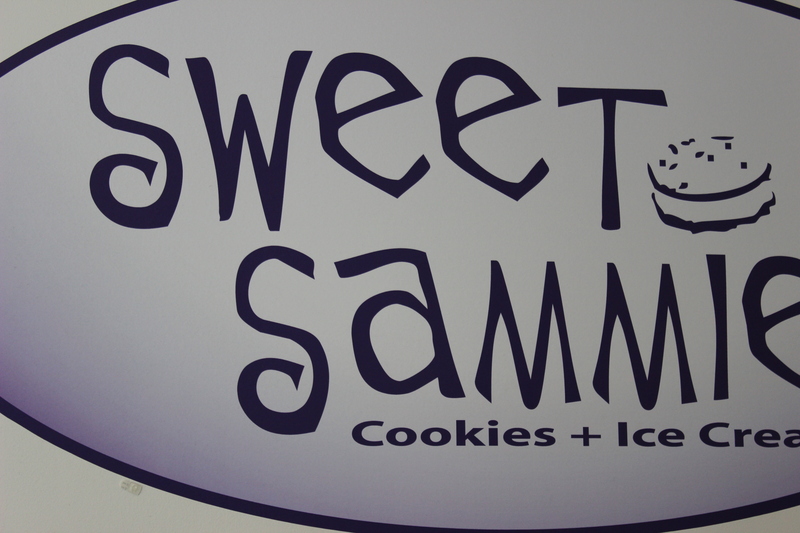 Next time you find yourself in Fort Worth, take my word for it and make a pit stop at Sweet Sammie’s. But don’t worry about being ladylike. 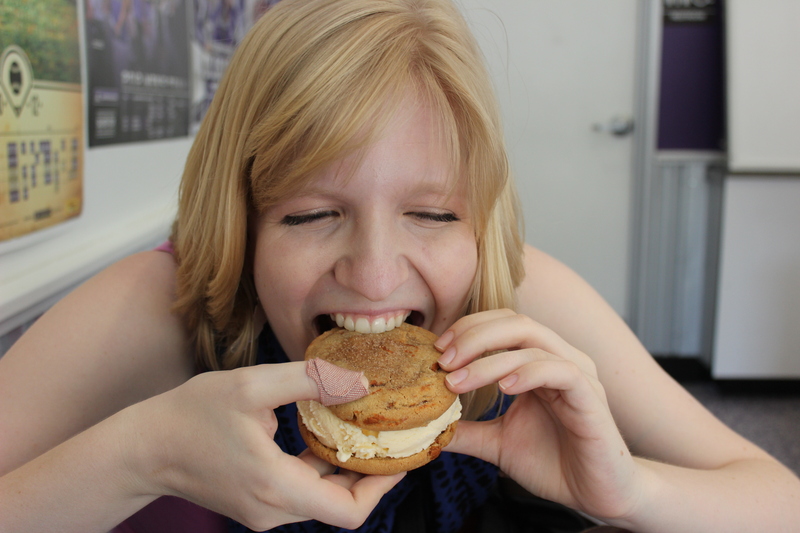 It is physically impossible NOT to get ice cream and cookie crumbs all over your face. Just embrace it–we won’t judge. I’m obsessed with bike tours. Think about it: the wind in your hair, a knowledgeable (and in this case, Scottish!) guide, pain-free feet… In my humble opinion, bike tours are the very best way to see and experience a new city, big or small. Case and point: the Fat Tire Bike Tours Monet’s Gardens Tour. 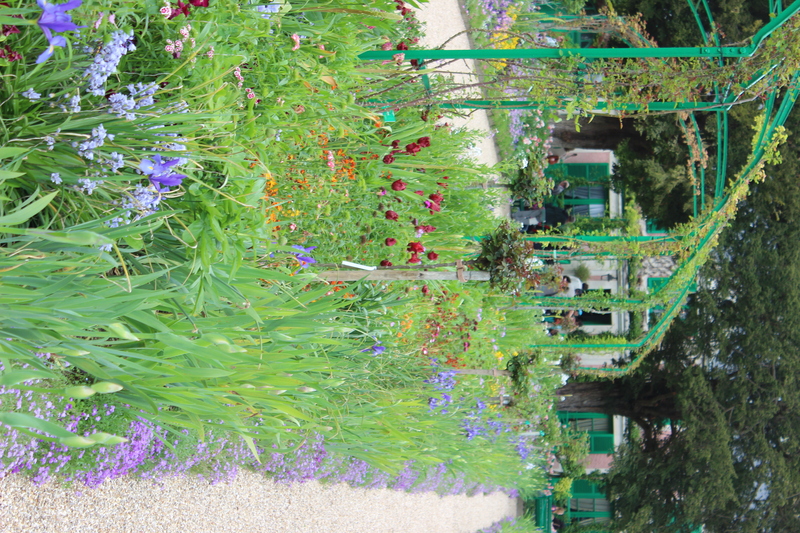 Giverny (via Vernon) is a short 45 minute train ride from Paris’ Gare St. Lazare, and my oh my is it WORTH THE TRIP. Sitting here on my couch in Dallas, I’m at a loss for words to describe the beauty and the… purity and the “fraîcheur” of the French countryside. After a picnic “à la française” (consisting, of course, of bread, cheese, pastry, and cider), we hopped on our bikes and, led by our fearless leader, Dave, headed for Monet’s estate at Giverny. 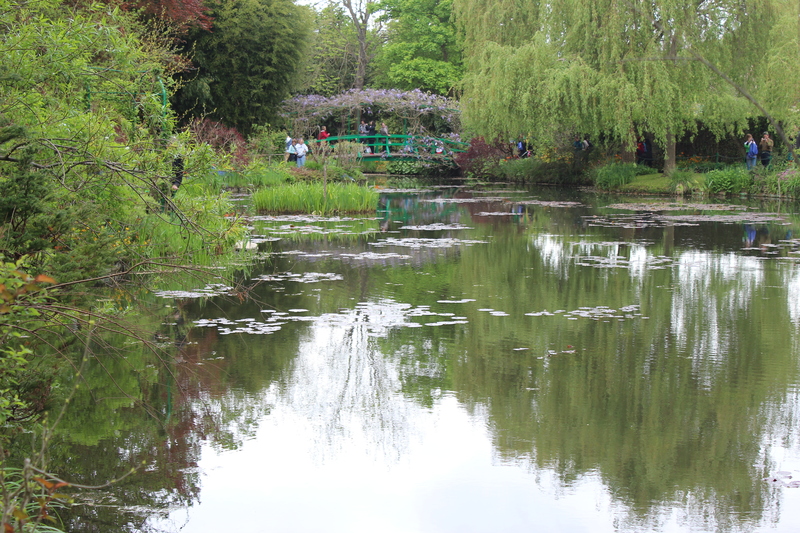 Giverny is… paradise. If I could describe my dream home, it would look (and smell!) a lot like the estate Monet designed for himself. It’s colorful, it’s inspiring… it’s truly unlike any other place I’ve visited. We started our tour in the waterlily garden, where Monet painted hundreds of his iconic “Nymphaes.” I could almost feel his presence there–it’s so easy to see why he was awestruck by the wild beauty of the water, the vines, and the flowers. 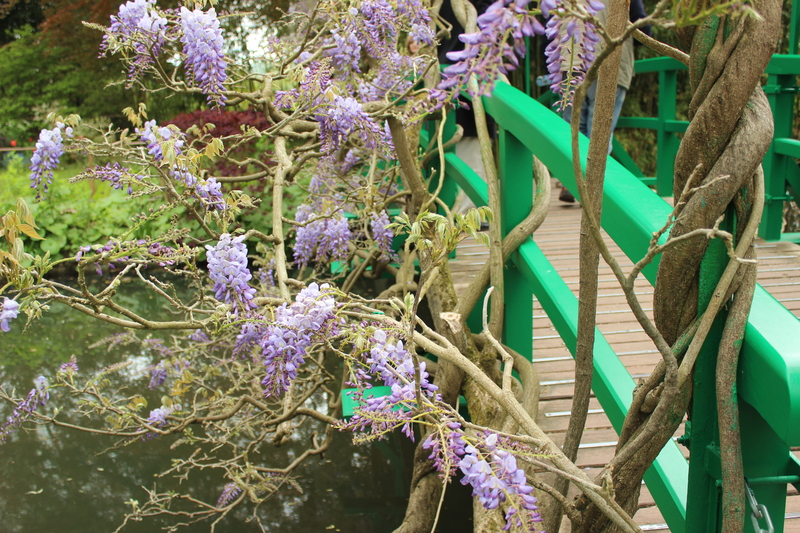 I was thrilled to have a chance to walk through the pastel-colored interiors of Monet’s home and see what he saw through his bedroom window–a painting in and of itself. Drop dead beautiful, seriously. Giverny? Definitely worth the trip. Fat Tire Bike Tours? Awesome. Truly a wonderful day, y’all. Wonderful. From their heads to their toes… to their doorknobs. 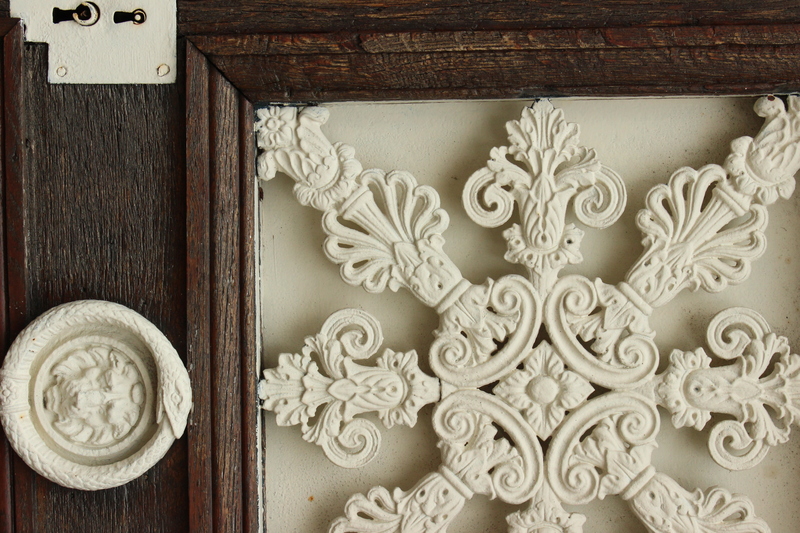 One day, my front door will look just like this one. I’m sure you were expecting a long, drawn-out blog post, weren’t you? 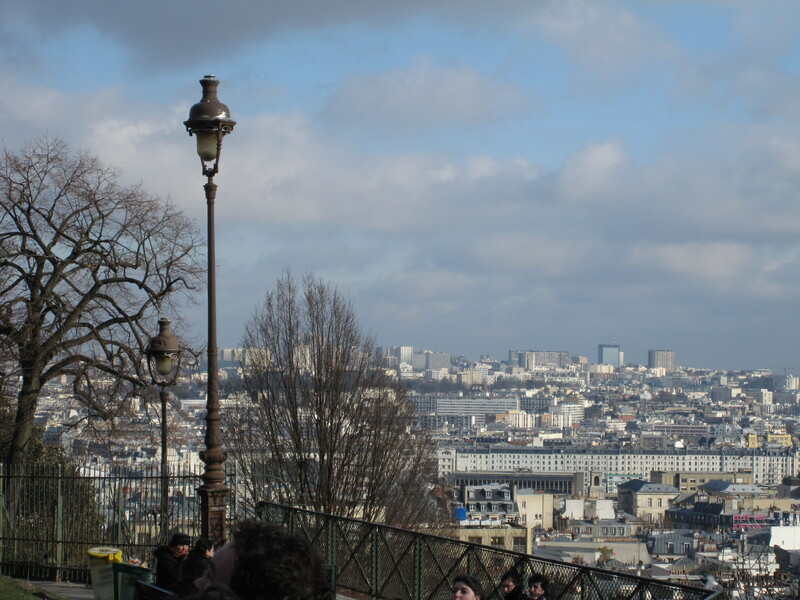 A detailed chronicle of my week in Paris? Well, sorry. I’m going to give you little glimpses instead. Easier for me, less reading for you… Sounds like a win win, does it not? And what kind of tourist would I be if I didn’t start with what is quite possibly THE best pastry shop in the entire world. (Disclaimer: I have not tried every pastry shop in the world, so we might be stepping in to the realm of hyperbole there…) Tucked in to an unassuming building in the Marais, near the Filles du Cavalaire métro stop, is the factory, the workshop, the wonderland: Jacques Genin. Monsieur Genin is known worldwide for his pastry, his chocolate, and his caramels. And stepping in to his shop (which also houses a modern little café) is like stepping in to sugar heaven. So much so, in fact, that I visited twice. Calories don’t count in France, right? 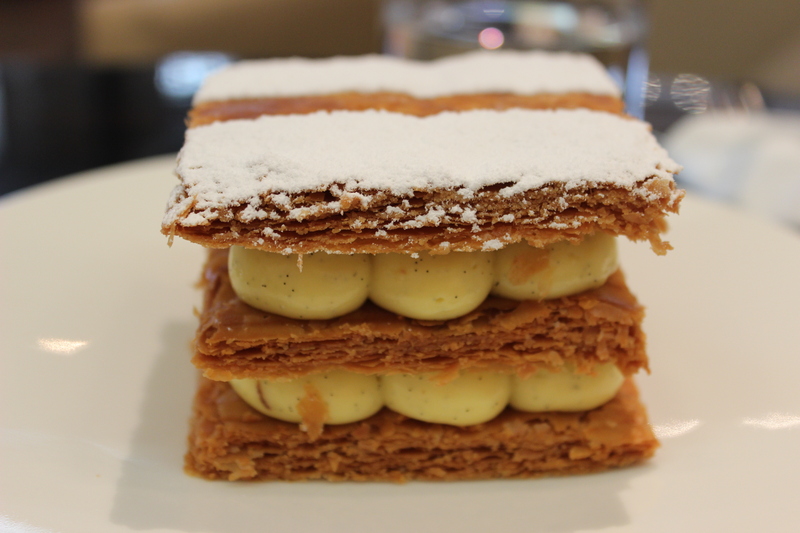 The mille-feuille vanille framboise (or vanilla raspberry). The flaky, delicate layers of pastry complimented the not-too-sweet vanilla pastry cream perfectly, and the raspberry preserves (also not-too-sweet!) added a delectable hint of tanginess. 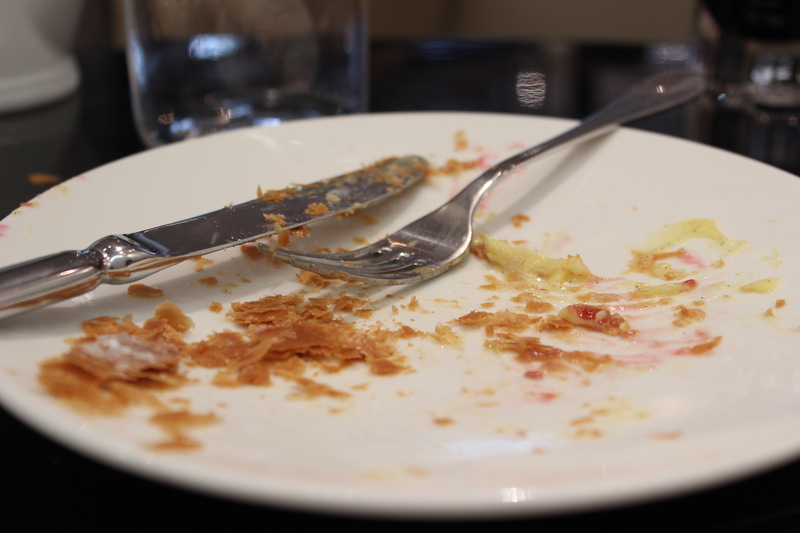 The pastry looked like it would be crunchy and dense, but it literally fell apart when I touched it with my fork. Delicate, buttery, surprisingly light… Oh man. I am not kidding when I tell you that this is one of the most delightful things I’ve ever eaten. Worth the price of admission (or airfare) for sure. No crumb left behind, people. And the awesomeness doesn’t stop there. Monsieur Genin knows how to treat his guests. With every order comes a tiny little plate of candy, just enough to taste. This time? Milk chocolates with hazelnut crunchies (not the technical name, but an accurate descriptor nonetheless). Well SURE, I’ll have some free bonbons to go along with my pastry and coffee! Twist my arm! 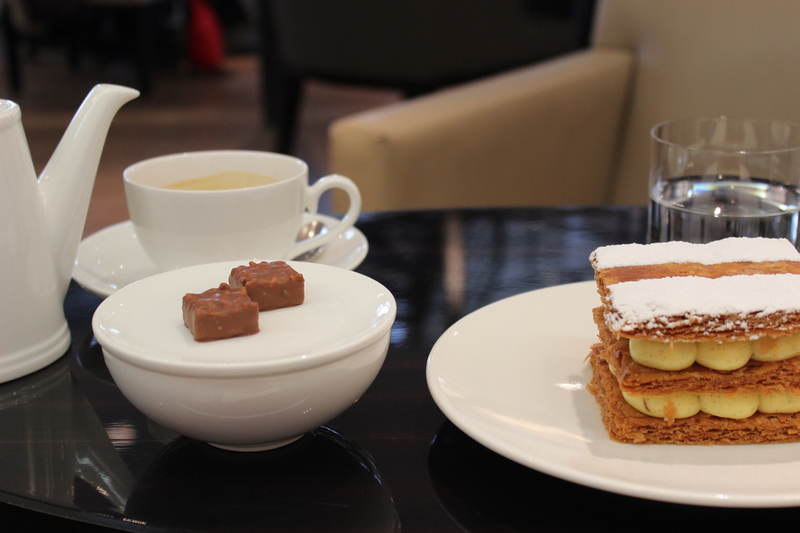 (And I was not shocked to discover that the chocolates were *almost* as yummy as the mille-feuille. Almost. Say it with me: “I will go to Jacques Genin. I will sit down in the café. I will savor every tasty bite.” Your taste buds will thank me, I promise. And don’t forget: calories don’t count in France. Colorado Springs is my new favorite city in America. The mountains are majestic, the weather (in the spring) is perfect, and well… I didn’t want to come back home after spending three days there. 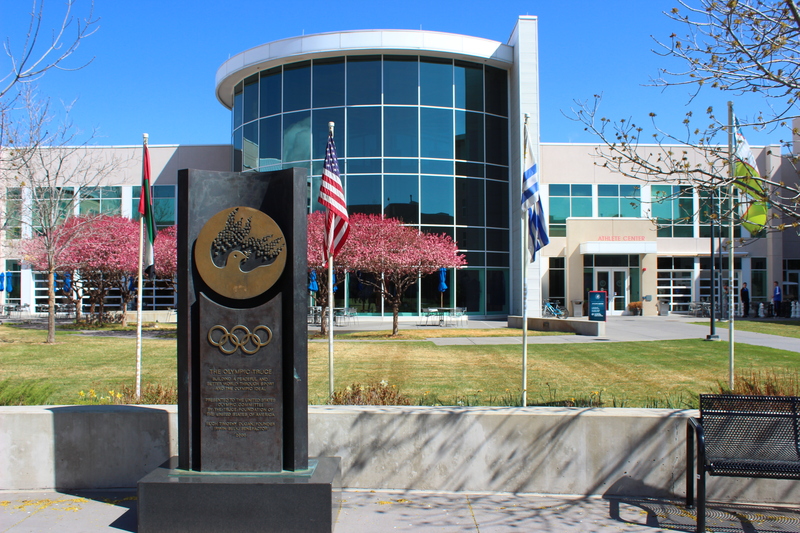 We spent a majority of our time at the Olympic Training Center. My brother (the rockstar) qualified for the Junior Olympics in air rifle (yes, it’s an Olympic sport. Really. ), so my family and I trucked (or in my case, flew) up to Colorado to cheer him on. The OTC is, for lack of a better word, inspiring. I can easily see why a young athlete would want to live there. Heck, I want to live there! World class facilities, the Colorado mountains, and oh yes, an unlimited supply of food in the athletes’ cafeteria. Sounds like a pretty good deal to me. But lest you think we spent all of our time stalking Olympic athletes and drooling over giant plates of food (only athletes are allowed to eat in the cafeteria anyway. Tyranny, if you ask me. 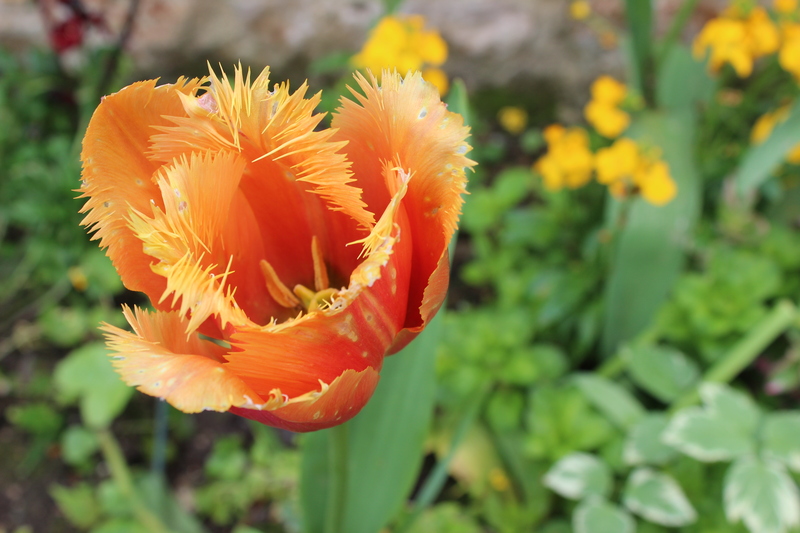 ), there’s much more to see and do in “Springs” than play the “guess the country flag” game. 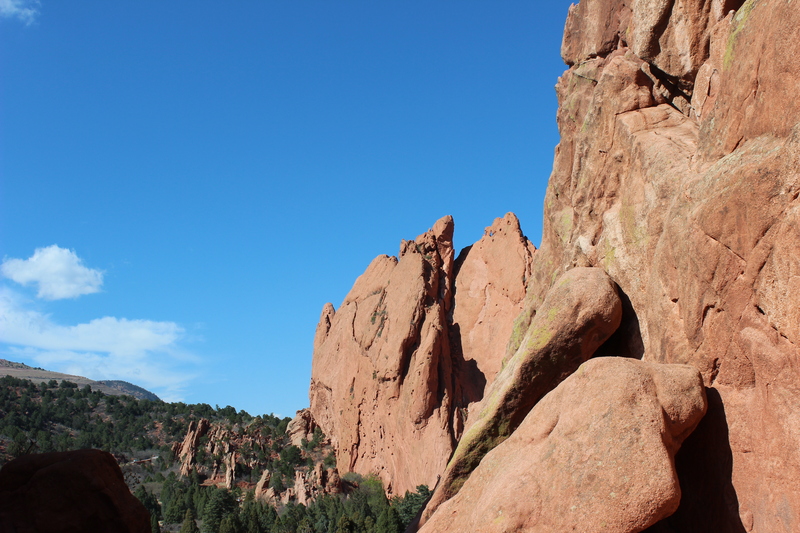 While Matthew fraternized with athletes from around the country, my parents and I went to Garden of the Gods and drove the winding road to the summit of Pikes Peak. Literally jaw-droppingly beautiful. I haven’t spent much time around mountains, but I’ll tell you this: it would not hurt my feelings to live where the air is a bit thinner. See? Told you it was amazing. Sadly, I don’t have much to report in the way of delicious restaurants. That is THE one aspect in which Colorado Springs was… well… less than exciting. I was expecting local eateries, Trader Joe’s, you know… Austin-y things. And “Springs” didn’t deliver, unfortunately. But I guess the mountains make up for all of that. Or at least I’ll keep telling myself that. After spending three days in Colorado, I told my brother that he needs to kick himself in to high gear so he can become a “resident athlete” at the Olympic Training Center. So that I can visit. And also so he can be successful. But really so that I can visit. 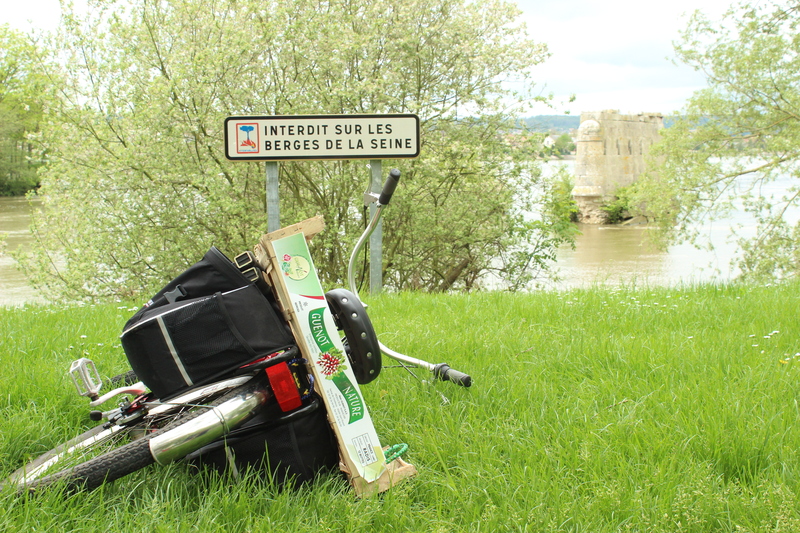 … to Paris, that is! Since May 14, 2010, I’ve been counting down the seconds until my next opportunity to jump across the Atlantic and revisit the City of Lights. And now, thanks to discounted travel privileges and six days of precious vacation time, I finally have my chance. In 22 days. And man oh man, I am PUMPED. So please excuse me if, for the foreseeable future, you hear a lot about Paris. Excuse me? Yes. Sorry? No. À bientôt, mon coeur. À bientôt. A few weeks ago, my parents and I planned a quick weekend trip to Santa Fe (by way of Albuquerque) to celebrate my dad’s big 5-0. My parents reminded me that I had, in fact, been to Santa Fe once before, but since that was more than 20 years ago, I’m going to go ahead and call this my first visit to the land of chiles and adobe. Now first of all, I have to brag a little bit about the weather during our trip–we LUCKED out. The sky was beautiful and blue all weekend, and even though it was admittedly a bit cold and very blustery, I wouldn’t have traded it for the world. Traveling is much more fun when the sun is out, don’t you agree? In the interest of avoiding boring you to tears, I’ll spare you the play-by-play of our trip and just share some of my highlights instead. Less writing for me, more pictures and less reading for you–sounds like a bargain. 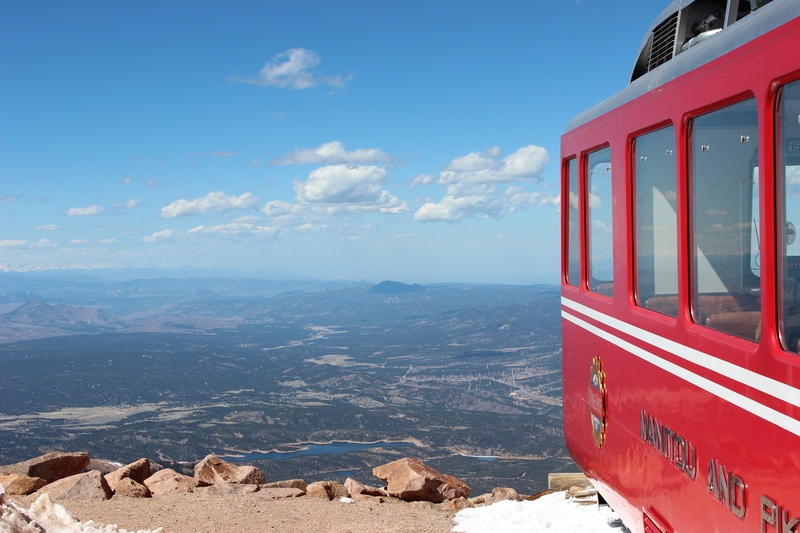 Taking the tram to the tippy top of Sandia Peak was easily my favorite part of our trip. 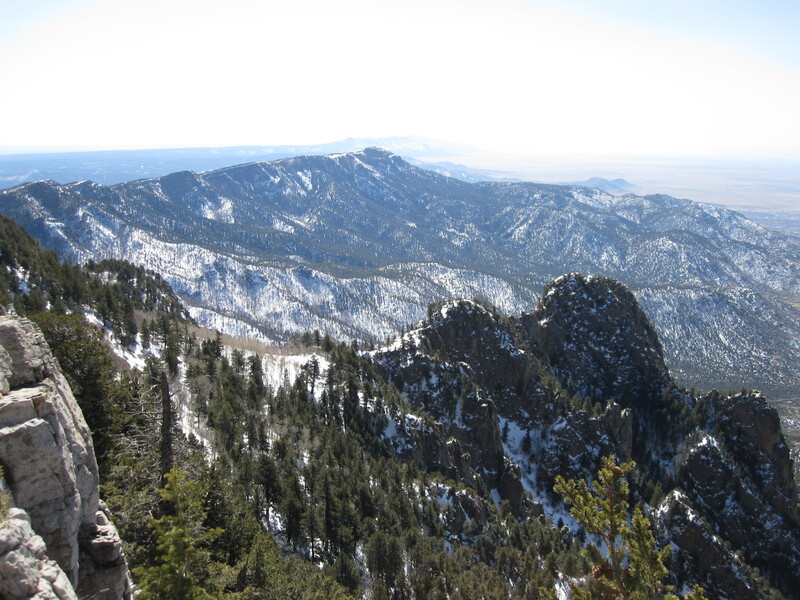 New Mexico is beautiful, and it was worth an admittedly harrowing tram ride to get such a great vantage point. 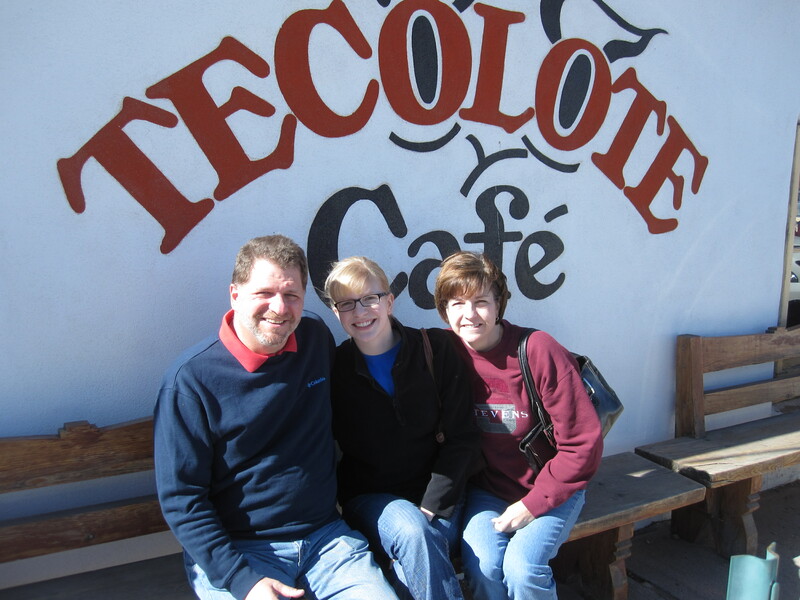 Tecolote cafe: “great breakfast, no toast.” Ok, I’ll admit: I found this little gem after googling “Diners, Drive-Ins, and Dives.” Not one of my favorite shows, but WOW this place was amazing. No toast, you say? No, because there was a basket full of fresh pastry goodies instead. Oh yes. So good. The Buffalo Thunder casino, north of the city. Just as ridiculous as it sounds, and we had a great time. Stuffed Sopapillas at Tia Sophia’s in the Santa Fe square. Seriously. Don’t even look at the rest of the menu. Jewelry vendors in the square on Saturday morning. But my favorite thing about the city? THE COLORS. I can’t even describe the vibrancy–every building, inside and out, was littered with stunning designs in beautiful yellow, green, red, and blue hues. Pictures don’t do it justice, so you’ll have to check it out for yourself… Just an hour and a half’s jaunt from the Albuquerque Sunport.